Can you export/import SnagIt preferences? Is there a way to export all my SnagIt settings to a file so I can import them into another instance ot SnagIt? I have everything just the way I want it on one workstation, and want to have the same settings on a couple other workstations without manually tweaking each setting. When you say you want to import settings... do you mean for your captures? Or other settings? If so.. what would those be? 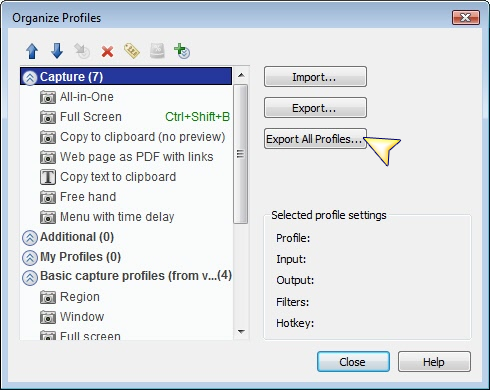 If you are referring to your capture profiles, you can choose to export all of those and import them into your new environment. 1. From Snagit, select File > Organize Profiles. 2. Right-click a profile and select Organize Profiles. 3. Click Organize Profiles in the Related Tasks area of Snagit. Then, just do this same thing in your other environment and import the files you just exported. I'm not talking about my capture profiles. I'm talking about the program preferences. For example, selected color (silver), Quick Access toolbar selection of buttons and location at top of screen, minimized ribbon, ESC to exit editor but leaving editor loaded, etc. I'd like to be able to export those settings and not have to re-create them manually at each new workstation. For example, I want to set up my a callout button on the Quick Access toolbar so that it uses a rounded square with shadow, 2px black border, Arial 10pt text. I can set all this up by creating a call-out on an image, and saving the settings to the Quick Access toolbar, but I don't want to have to go through all those same steps at each new workstation I use. I'd like to just import a settings file. Hi Robokev - Another customer asked this question today and I realized we had not fully answered it for you. Sorry for the long delay! The short answer is: there is no "export settings" option inside Snagit. While it may technically be possible to duplicate all preferences, it involves a lot of registry changes and is not something we advise customers to do. If you feel like this is still essential for you to do, please inquire with our support department (http://bit.ly/ts-support - Ask a Question tab). Also I noticed that you mention installing Snagit on multiple workstations and wanted to clarify that the license agreement (PDF) permits installing a single-user license on two machines used by the same person, but not more than that. In order to restore your Snagit preferences import the key that you've previously exported.